Judy Marie (Schrag) Regier, devoted wife, loving mother, grandmother and great-grandmother, went to be with the Lord on Tuesday, Jan. 29, 2019. Judy was born Sep. 23, 1943, in Newton, KS, to Marvin and Bertha Schrag. 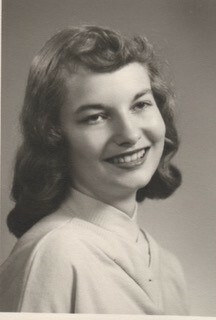 Judy grew up on her family farm in rural Moundridge and graduated from Moundridge High School in 1961. Judy married Louis Regier in 1964. They lived in White City until settling on the farm in Butler County in 1968, raising three children. They sold the farm in 1986, and moved to Phoenix, then Prescott, AZ, where they worked at a church camp until 1989, when they moved back to Kansas. They lived in rural Reno County and in Hutchinson before moving to Kidron Bethel Village in 2003. After losing her husband in 2010, Judy remained at Kidron. She enjoyed visiting with her neighbors, attending community events, reading and doing countless puzzles. She was preceded in death by her parents, Marvin and Bertha Schrag, husband, Louis, and sister Jane (Keith) Ford. She is survived by her siblings, Delilah (Lester) Wedel of Newton, KS, Dale (Carol) Schrag of Newton, KS, Diana (John) Desmond of Newton KS, Don (Shirley) Schrag of Inman, KS, her children, Douglas (Wendy) Regier of Newton, KS, Teresa (Christian) Fluck of Prescott, AZ, and Cheryl (Russell) Plumley of Moundridge, KS, five grandchildren and eleven great-grandchildren.